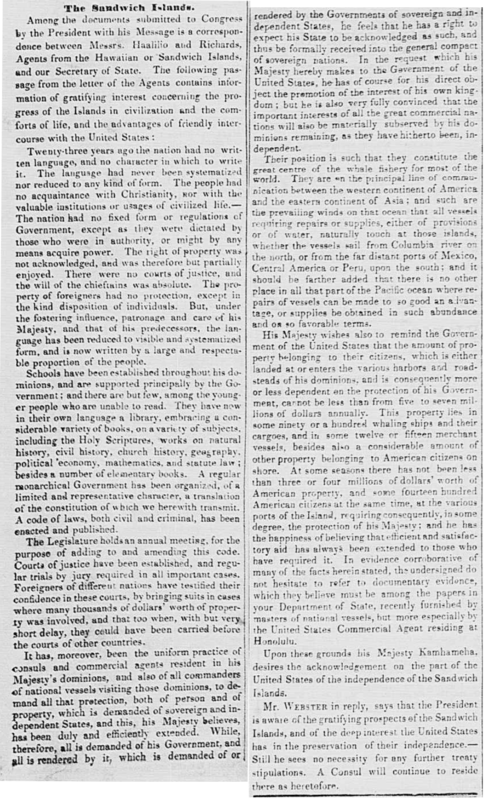 New-York Daily Tribune, Volume III, Number 12, Page 2. April 22, 1843. 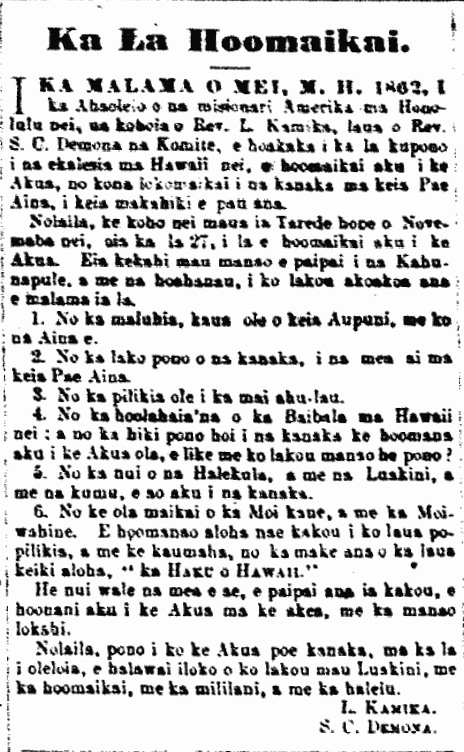 La Kuokoa, the early days, 1846. On the 28th of November, 1843, the nations of Britain and France recognized the independence of this nation of Hawaii; therefore, the 28th of November every year is a day of joy, a day of rest from work, of feasting, of fellowship. So too was this past holiday, the 28th of Nov.; there was no work done on Oahu, as it was a day of rejoicing for the independence of this Kingdom. 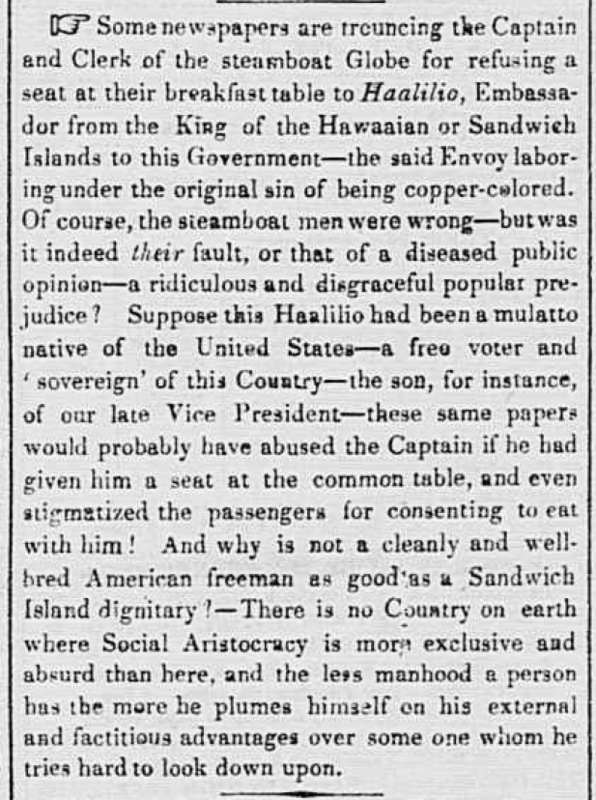 At 12 noon, the cannons rang out, the naturalized haole held a party at [Mau…lika?] and the King held a banquet at his [?] with his alii and the young alii. The doors of the palace of the King were opened, and crowds of haole and [?] came to see him. Present was the American Consul in his beautiful attire as well as the Consul of Denmark. Early in the morning of that glorious day, the King and some alii entered the hous of Jehovah as well as many of the public, to give thanks to the one to whom the nation belongs. This was as it should be, for Jehovah is the Head of Monarchs of all kingdoms, who cares for and who overthrows, from who comes protection and independence of a nation, [?] and the people rejoice in him. Should this nation, Hawaii, be blessed, the glory goes to God, and not upon the alii and man. At our assembly in the house of God on that happy day, the Pastor spoke on this topic. The lesson of this passage was, ‘There are many sins committed by the people and alii of Hawaii, and yet God has not forsaken them. God sees the drinking of alcohol, the fornication, evil deeds on his sacred day, the worshiping of idols, the fighting, the the overburdening, the snatching, the stealing, the lying, the indolence—and yet God has not forsaken you; he is patient and gives blessings. This nation was near lost, but was held fast by God who returned the rule of the land, and his nation is expanding, along with his righteousness and grace, from one corner of the land to the other. Therefore we must acknowledge Jehovah, and always give him praise, and listen to his voice. Don’t just boast of the independence of the nation, but act intelligently and righteously. Leave laziness behind and work, and ward off all evil things and hold fast to the things which will elevate this independent nation. And then God’s blessings and patience will be worthwhile. Ka Elele, Buke 2, Pepa 17, Aoao 135. 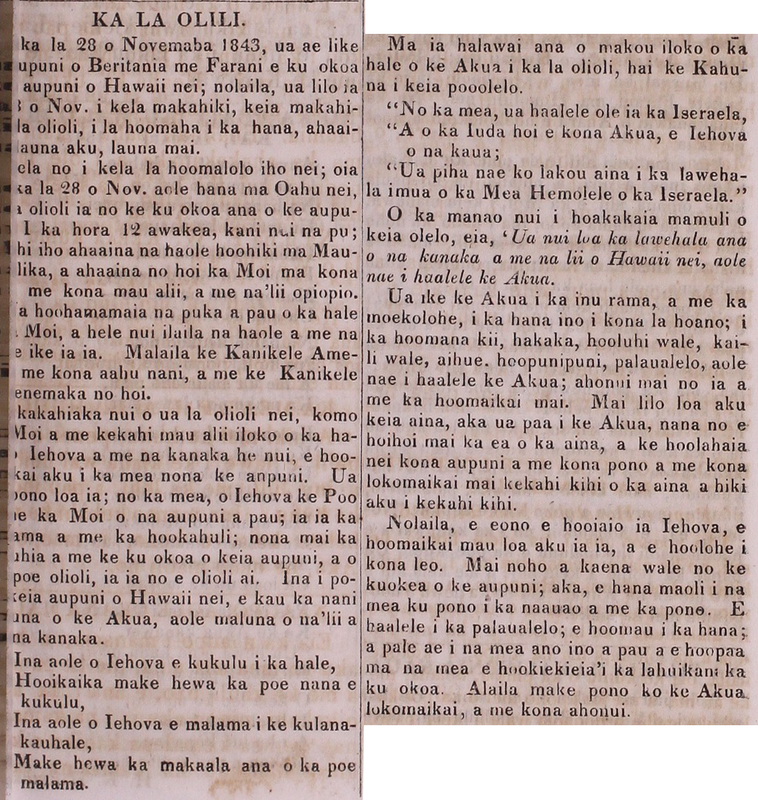 Dekemaba 12, 1846. In the month of Mei, 1862, at the Conference of American missionaries here in Honolulu, Rev. L. Smith, and Rev. S. C. Damon were chosen as the Committee to clarify the appropriate day for the churches of Hawaii to give thanks to God for his blessing the people of this Archipelago in this year which is coming to an end. Therefore, we select the last Thursday of this November, that being the 27th, as the day to give thanks to God. Here are some reasons to encourage the gathering of pastors and church members to celebrate this day. 1. For this Nation’s peace, and lack of war with other Countries. 2. For the availability of food for the people of this Archipelago. 3. For the lack of trouble from pestilence. 4. For the spread of the Bible here in Hawaii; and for the ability of the people to worship the living God as they wish? 5. For the abundance of Schools, and Churches, and teachers to teach the people. 6. For the good health of the King, and the Queen. Yet we remember with aloha, their tragedy, and grief, for the passing of their beloved child, “Ka Haku o Hawaii”. There are many other things to encourage us to glorify God in the open as one. Therefore, God’s people should gather at their churches on the specified day, to give their appreciation, exaltation, and songs of praise. 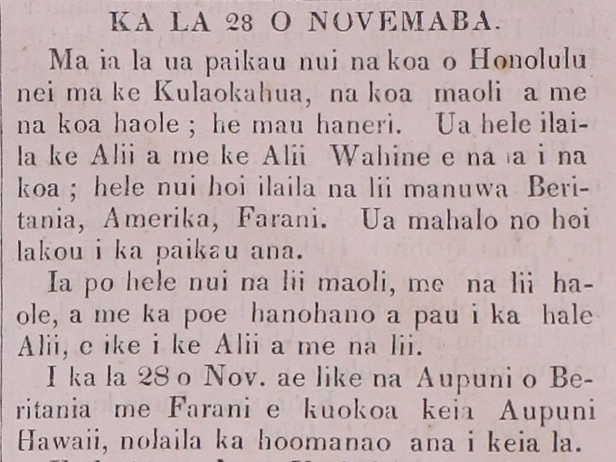 Nupepa Kuokoa, Buke I, Helu 52, Aoao 3. Novemaba 22, 1862.